Go B1G or Go Home: OSU wins it! 9 Big Ten Bowl Teams, will this be it for Urban? Kevin and Troy have a lot to get to, but had a lot of things to take care of the past couple weeks. The result? A quick, hard-hitting B1G show. 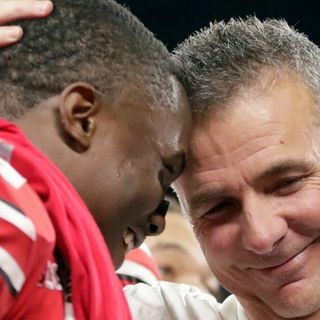 The youngster and old man discuss the Big Ten title game between Ohio State and Northwestern before talking and Urban Meyer calling it quits. Is this the true last time we’ll see Meyer? The Rose Bowl? Or will he be back in college football sometime soon? After that, the duo goes over the nine Big Ten teams and the nine bowl games they will be playing ... See More in starting on Dec. 26. In the weeks ahead, Kevin and Troy will focus more on basketball, while previewing the bowl games as the time comes. Next week, anticipate a full-on basketball show for the first time this season, folks. The youngster and old man are ready for hoops.